i've always thought that the album prosumer did with murat tepeli should not have been called 'serenity', but 'sincerity'. for me this is a much more accurate description of prosumer's music: there is a real honesty to it. it is genuine, it is pure, but not in a doctrinaire way. it's from the heart. there are no gimmicks or fancy tricks with this guy, it is all quite simple: prosumer has a bag of great records that he likes to share with people. recently i've been getting quite dispirited with many of the people i've been seeing and dealing with in and around electronic music. most people seem more worried about taking a piece of an ever shrinking pie, the beauty and joy of this music is increasingly lost in people more worried about promoting themselves than about creating and sharing something special. what i love about prosumer is that he gives. he deeply cares about the music and he shares that with others. what he does so well is connect with his audience and lets people get lost in the beauty of house music. rarely have i seen a DJ as successful at simply making people happy. this is the magic of prosumer. 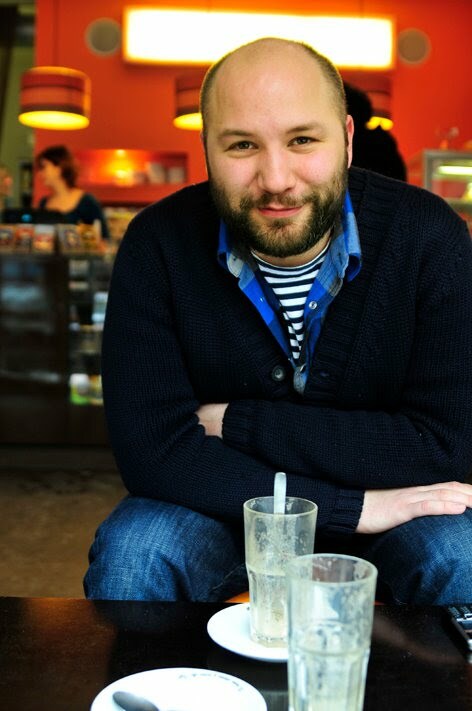 PC and i have been long term admirers of prosumer's work and since the blog started we've hoped that at some stage we would be lucky enough to get him to do a mix for us. the fact it has happened now is something we are really thrilled about. prosumer is a great example of the kind of DJ we are about, and it is a pleasure to feature this new mix from him. the occasion that prompted this mix is prosumer's upcoming visit to tokyo. i saw his debut here last year and it was a fantastic night. he is super excited to be coming back to japan, and so are we! he is playing as part of a special doubleheader at eleven (formerly club yellow). 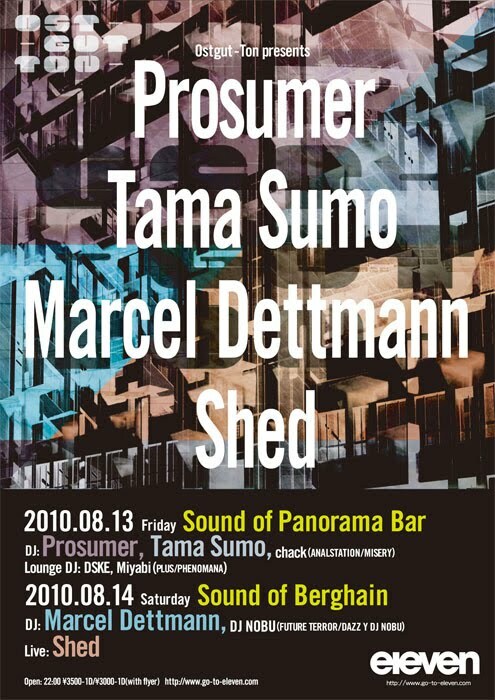 on friday 13 august, there is the 'sound of panorama bar' night featuring residents prosumer and tama sumo. on the following night, it is the 'sound of berghain' with residents marcel dettmann and shed. if my memory is correct, the lineups are reversed in nagoya (berghain on the 13th, panorama on the 14th). also it looks like prosumer and shed will be playing dommune on wednesday 11 august, so make sure to tune it for that. to everyone in tokyo, definitely come down to eleven on the 13th and 14th. these are going to be two great parties! big thanks to prosumer for this mix. hope to see all our tokyo friends next friday night at eleven for some quality house music! wow guys, the quality of the artists and the mixes you guys get must not only be a testament to the blog, but to you two personally. Now we're talking. Anyone hear his Villa Oslo mix from last year? Think it might've been ssgs what put me onto it - crackin'. This will be the perfect pre-clubbing mix for Dettmann und Steffi at the Bunker tonight. You've made me a happy little ssg as bright as bright can be! @marzie: I have not, but now I'm going to search for it now that you mention it. Top Bombing fellas. I love me some Prosumer. Should be seeing him again in Nov, so this'll nicely fill the gap between then & now. great mix. thanks mr prosumer, enjoyed your sounds at plastic people too. and thanks as always to the ssg guys for pushing the good stuff. Nice mix. I love the pic too. Very handsome! ostgut ton artist mix? d/l or buy 12" vinyl on site. keep the great mixes comin'! wish i was in tokyo. cant wait to hear the new shed and score it on vinyl! excellent. Thanks for this share of love. listening to this to get me in the mood of prosumer's visit to end of year riot in mancunia on Monday. What's the track at 40 minutes? Also at 1 hour 3 minutes?? Absolute killer!! !